Head over to The Children's Place where you can save up to 60% off clearance items. No coupon code needed. Shipping is FREE on all orders! I am snagging this tee for my son! 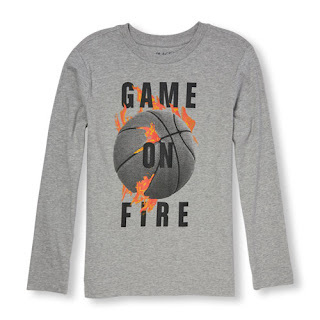 Boys Long Sleeve 'Game On Fire' Flaming Basketball Graphic Tee only $5.24 (Retail $10.50)!